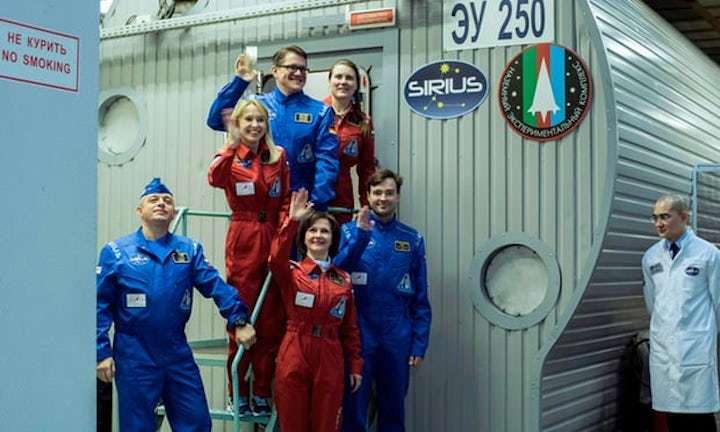 Three men and three women were sealed in an artificial spacecraft unit in Moscow on Tuesday in a simulation of a 17-day flight to the moon, a preparation for long-term missions. The experiment is the first of several in the Sirius (Scientific International Research In a Unique terrestrial Station) programme, which over the course of five years will gradually increase the isolation experiment to 365 days. Russia’s Institute for Biomedical Problems has partnered with Nasa for the project that recreates the conditions for a flight to the moon, one loop around it and a trip back to Earth. Oleg Orlov, the head of the project, said it would run parallel to the development of deep space aircraft. “By mid-2020s we will probably be ready for the actual flight,” he told AFP. Among the goals of the experiment is finding out what gender ratio is optimal for a long-term space mission, he said. “This is the first time in Russian or Soviet history when a space crew has included more than one woman,” the project’s psychologist Vadim Gushchin told AFP. Most of the crew are researchers or cosmonauts in training from Russia. There is only one foreigner: a German. The team has been locked in a 250 cubic metre (8,800 cubic ft) module after promising to do everything to complete their mission, which will also examine psychological and physical effects of isolation. “I’m convinced that we’ll be able to complete all of our tasks,” said commander Mark Serov, before disappearing into the unit. Russia has completed a number of on-land isolation experiments, including locking three men in a 24 cubic metre metal box for a year in 1967. The most recent long-term on-land mission was a simulated flight to Mars which locked an international crew of six men in a module for 520 days, ending in November 2011.